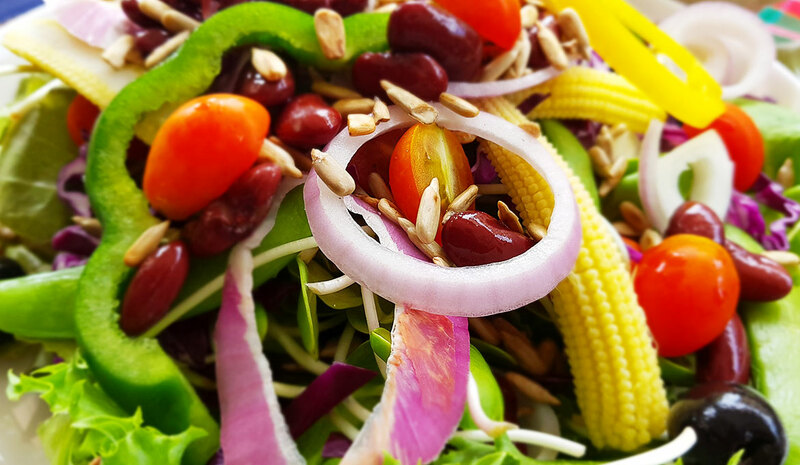 Fresh Healthy Salads and Smoothies using organic ingredients! I met the owners of this place at a food event we held here in Hua Hin. 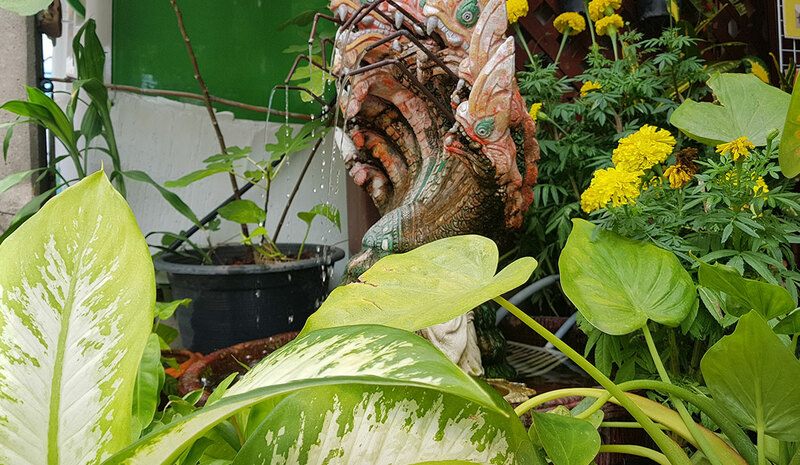 I was became really interested in the place when I heard about how they grow a lot of the food products them selves and help out with a lot of communities here in Thailand. Although the fresh and healthy meal options were appealing, the purpose behind this restaurant and other work they do was really impressive. Along with their fresh meals, the place itself has a really fresh feel to it – with a small water feature out the front so you can hear the sound of trickling water, some nice plants both surrounded around the entrance and hanging from the walls, as well as the open air type sitting arrangement – the place felt really organic. Today was quite a hot day, and although there is no air-con, there’s a good number of fans around which one of the staff will put by your table to make sure you’re not uncomfortable. The fan was enough for me – after riding my bicycle here, a couple of minutes in front of the fan and I was feeling fresh again and ready for my “fresh” salad! It reminded me of a little home owned version of “The Salad Concept” which is a popular salad franchis in Chiang Mai. 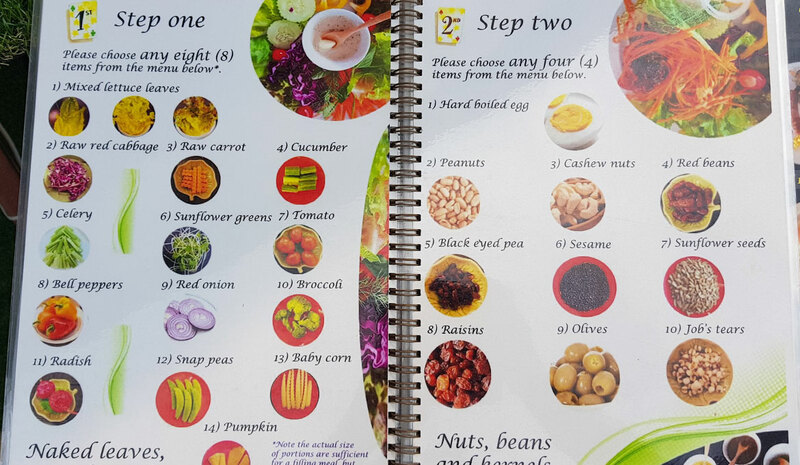 The reason for this was the way they had their menu organised – basically you choose your own ingredients and create your own salad from a long list of ingredients on the menu. The choice is huge and they are VERY generous with the servings. You get to choose at least 8 salad items, then another 4 more filling items, a type of meat and then a dressing. 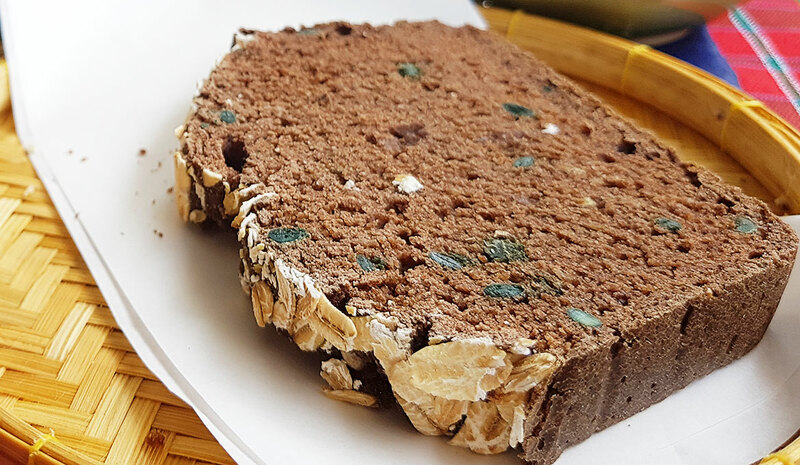 On top of this, your salad is also served with a home made slice of gluten free and vegan friendly bread – absolutely delicious by they way (I told the owner they should be selling the bread as a product on it’s own!). It took about 5 minutes after ordering and my meal was ready. 3 plates in total, one for my main salad, the other for my meat (chicken was my choice) and another for the bread – and then a separate cup for the dressing. 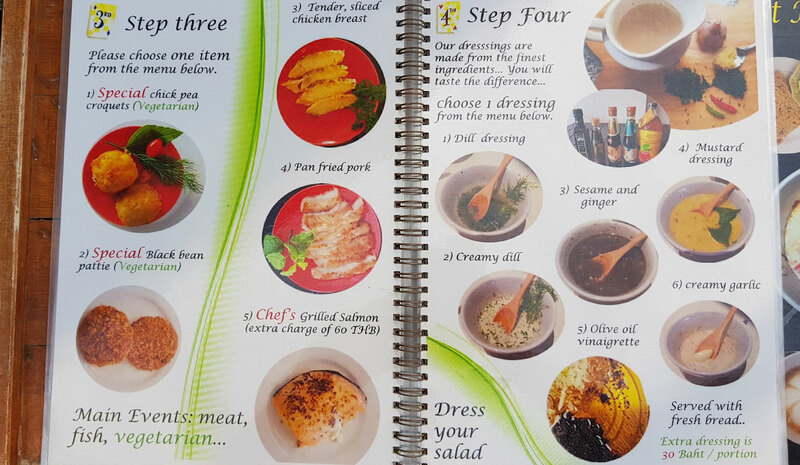 I couldn’t think of better way to serve a salad, they really give you the option of adding and selecting your own portions from the initial choice of salads from the menu, down to the presentation of the food where you can add the right amount of meat and dressing to your salad. The Salad was great on it’s own, but the dressing is what was impressive. I actually tried some of their home made dressings at the even I mentioned earlier – they were all amazing. I chose the ginger dressing for my salad and didn’t have to use much of it to put a good kick of flavour through my salad. 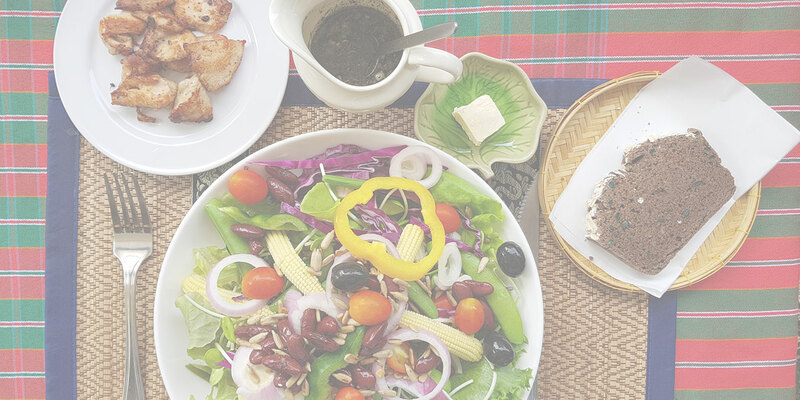 The salads are a fixed price of 190 baht – and considering the portion, I thought that was a great price. I got what I cam out for today, a nice healthy (western) meal without paying western prices – really impressed. 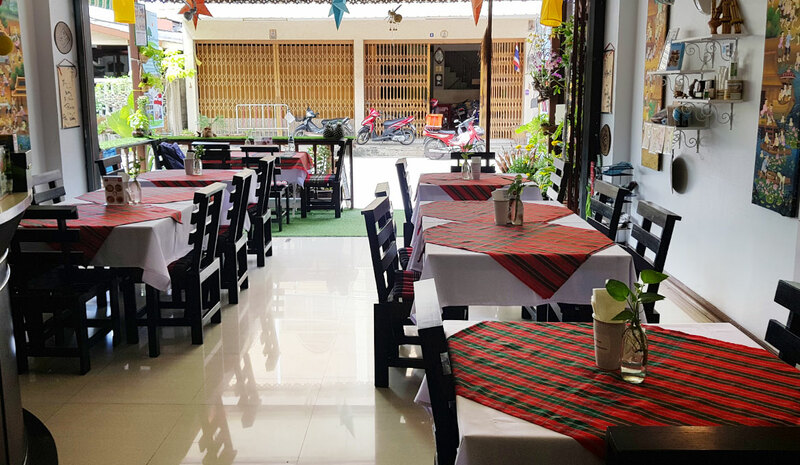 All in all the whole experience was pleasurable – from the nice welcoming, to the seating and ambiance, the taste and freshness of food – and the price – oh….not to mention the good WiFi as well! I’ll be back here again and already for sure as I already have the following two things lined up for my next two visits. 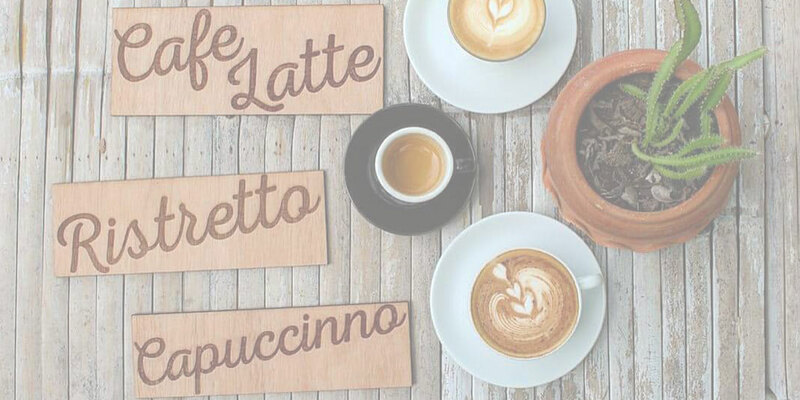 The freshness and healthiness of the whole menu! 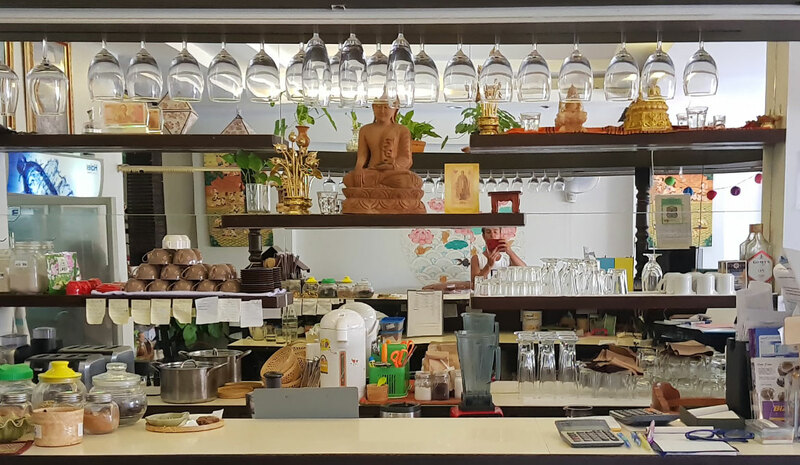 Yep definitely, need to try the smoothies and Thai food here – looks amazing! For a proper salad like you’re used to in western countries, you won’t find a better price in the area with the generous portions you get here. 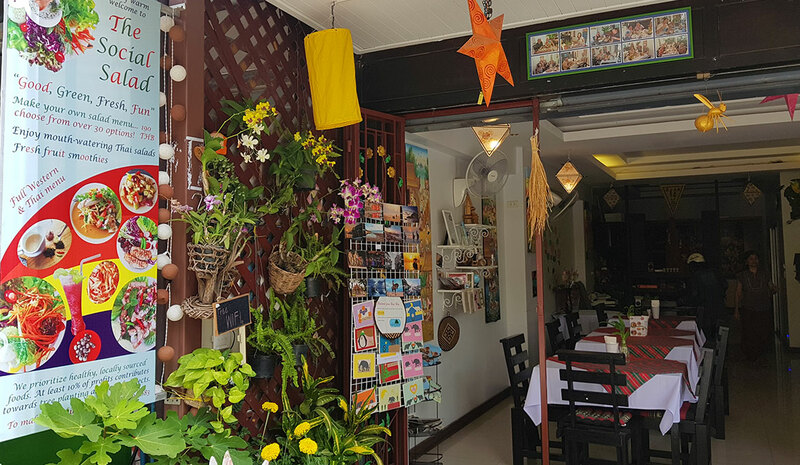 The Thai meals are also very reasonably priced for this area. 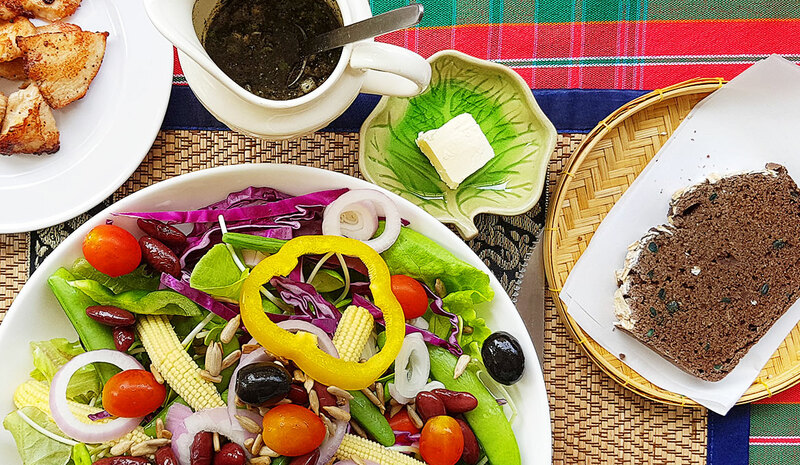 A salad is 190 baht and comes with a total selection of 13 ingredients, home made bread and dressing. 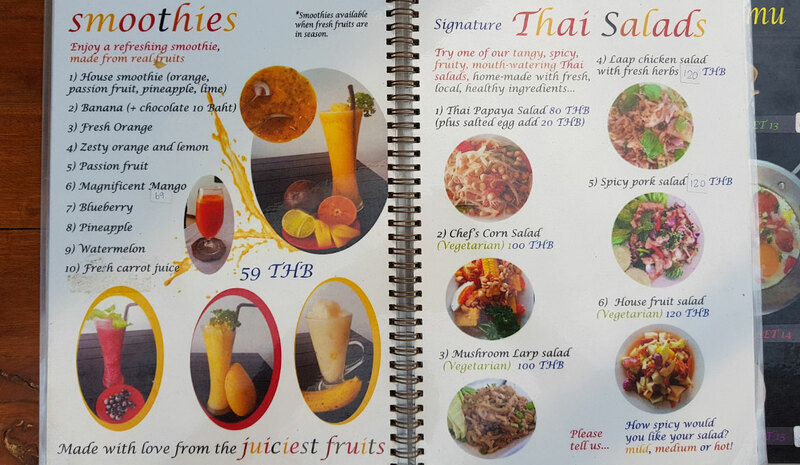 The Thai meals are between 100-200 baht. 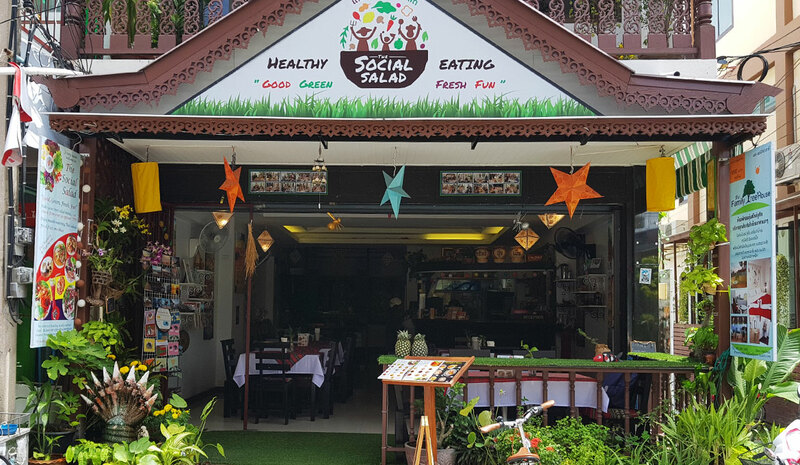 The Social Salad is our 2nd family business in Hua Hin. Our overall vision is to do business which benefits our suppliers, our customers, our staff and our family; and contributes towards a kinder, greener world. The first business, which we opened in 2011, is The Family Tree, a boutique arts and crafts store which offers arts and crafts handmade by over 40 community artisans, social and environmental organisations, and small scale family businesses around Thailand. So, The Social Salad seeks to build on the model of The Family Tree, by supporting local and sustainable suppliers, and by creating a welcoming space for our friends and customers to meet, chat, share, and create. Our mission at The Social Salad is to continually add more healthy, organic, and locally sourced dishes and ingredients to the menu. The food is all fresh and locally sourced. We already use some organic ingredients. For example, coffee, organic sunflower greens, basil and other herbs (grown at home), and high quality organic oils and apple cider vinegar used in our dressings. We also have our homemade bread, which includes organic, vegan and gluten free options. We also buy ‘chemical-safe’ foods from Golden Place / The Royal Project, produced according to Good Agricultural Practices (GAP). This means that carefully selected pesticides and fertilizers are used. However, their use is strictly controlled according to the instructions, and crops are planted, fertilized and harvested on a timed cycle which avoids harmful residues. At Golden Place and Royal Project shops, this is controlled using laboratory testing. 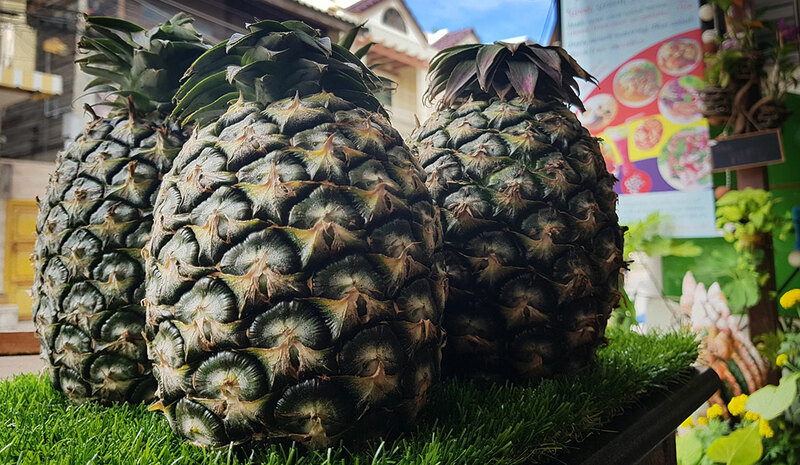 To further increase the amount of locally sourced products means identifying local, small scale farmers within 60kms of Hua Hin. To do this, we have partnered with Stamford University on the Green Market Bridge project. The students are going to help to identify suppliers. 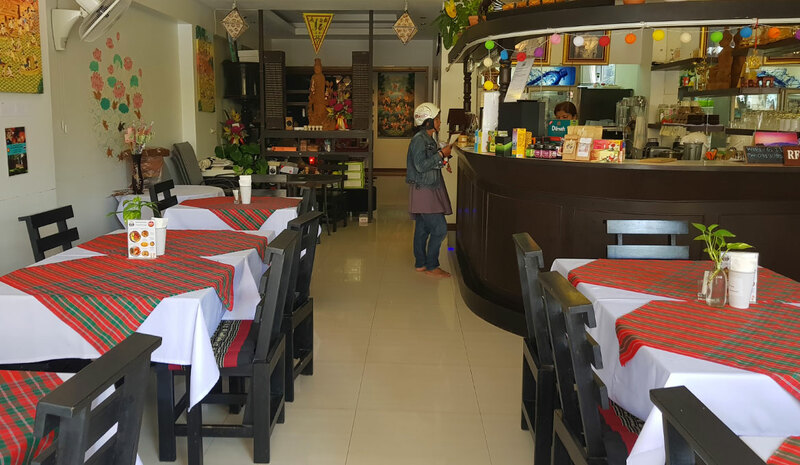 Later, in order to make it worth it either for us to travel to the suppliers, or the suppliers to travel to Hua Hin, we will need to jam with other restaurants. This will be the next step after we assess the situation. Outside of the menu, we provide take away food in biodegradable containers. We donate at least 10% of profits to social and environmental work. An example of this is our Free From Foam project. We donate sets of high quality melamine table wear to Buddhist temples which are used and washed, replacing foam and plastic. So far we have donated more than 6000 sets. Each set contains a plate, bowl and cup which will be re-used hundreds of times. Working on only 100 uses per item, that is 1,800,000 pieces of foam / plastic which do not need to be used over the lifetime of the investment. We also organise regular tree planting activities at a temple which we support in Pa La Uh. See here and here for examples. I hope this is useful. We are not perfect, but we are trying to do something real :-). 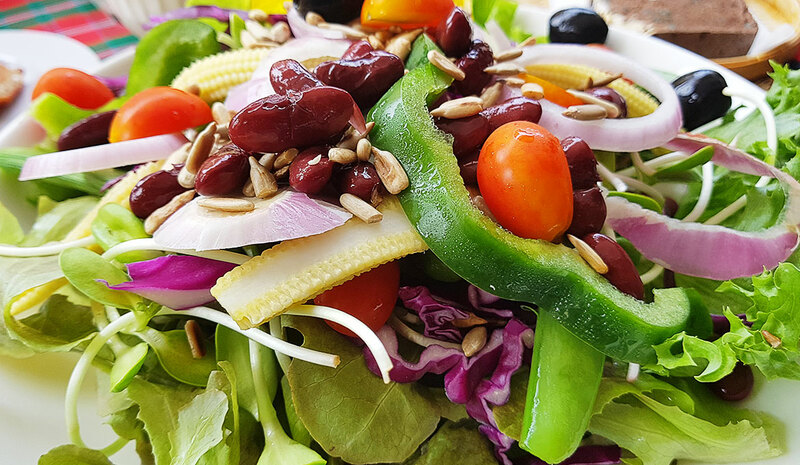 Comments and content thanks to Khun Dtor, Owner-Manager of The Social Salad.